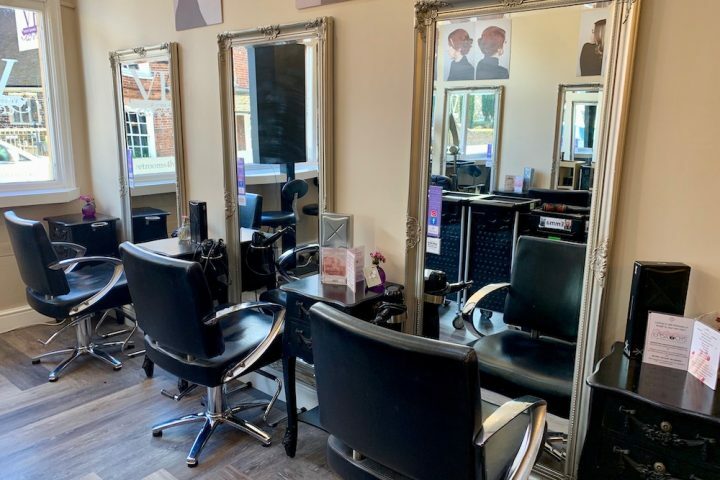 One of the best cuts and colours I've ever had was at this hair and beauty salon in Horley - now it can be your best kept beauty secret too. I’m desperately seeking highlights. Something to brighten my copper tones and cover up the grey tufty bit at the front (why is it always at the front?). But to complicate things the rest of my hair is frazzled and bleached out by the summer sun. The colour is all over the place, basically, and needs urgently sorting. Plus, a bit of a trim to sort out these overgrown layers would be splendid. It’s down Victoria Street, in the centre of Horley, amid a smattering of local independent shops including Collingwood Batchellor, the lovely homewares shop. 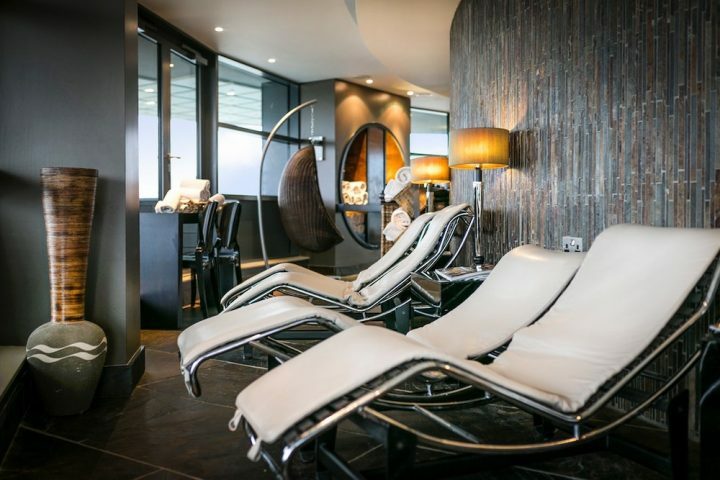 The salon itself is fairly spacious – bright, chic and minimal, with immaculate white walls and black tiled floors. As for the staff, they couldn’t be more smiley and welcoming making it the kind of place where your shoulders automatically drop three inches as you walk through the door – and relaaax. Full marks too for the thorough consultation. The colour test is a proper 30 minute consultation – rather than a hurried pop-in-and-we’ll-plonk-some-colour-behind-your-ear jobbie. My colourist Sophie Wood, a Wella colour expert, asked me loads of questions about my lifestyle before working out what to do with my hair. She takes into account things like how long you have to get ready in the morning (er, approx 2 mins) and how often you blow-dry your hair (never) and tie your hair back (too often). She also wanted to know how often I had it coloured and where – and when I sheepishly admitted I sometimes do it myself (*gasp*) she didn’t bat an eyelid. I loved her for that. The result is a colour and cut that not completely impractical for real life: the colour won’t need touching up every two weeks and the cut will suit my naturally lazy self. 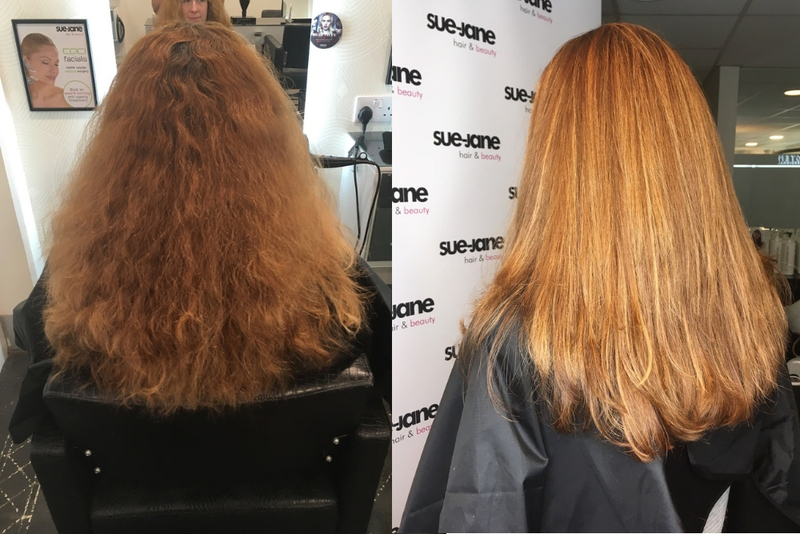 Sophie applied a base shade of golden brunette and scattered blonde highlights throughout, which she then toned with a golden red. She racked up lots of tiny foils, so the golden red highlights are subtle and expensive-looking rather than stripy (always the fear with highlights). At the sink Sophie applied a Wella colour save treatment, which makes the colour last longer and anti-oxidates the hair (which I’m pretty sure is a good thing!). 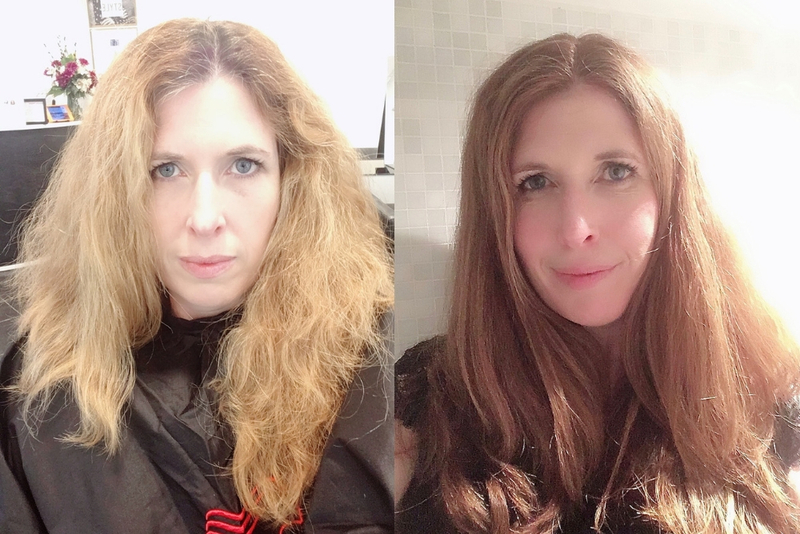 My hair is ridiculously thick and naturally curly – a combination that requires a delicate balance to get the layers and thinning out just right. Take too much off, and the curls fly off in every direction, putting the bouff well and truly back into my bouffant. Don’t take enough weight out, and my locks looks heavy and the curls lank and lifeless. Oh yes, my friends, it’s a constant struggle. Sophie levelled out the layers, and took just a smidge off the length. She shaped the hair around my face, then she blow-dried it and trimmed it a bit more once dry. I always go for a straight blow dry at the hair dresser, because it takes me so darned long to do it myself and it feels like a real treat. Voilà. I was thrilled with the colour. It’s bright and vibrant, but not too over the top. And crucially, it’s easy to maintain. A full head of highlights with Sophie starts at £90, with a half head from £75. With a more junior colourist a full head starts at £60 and half at £45. 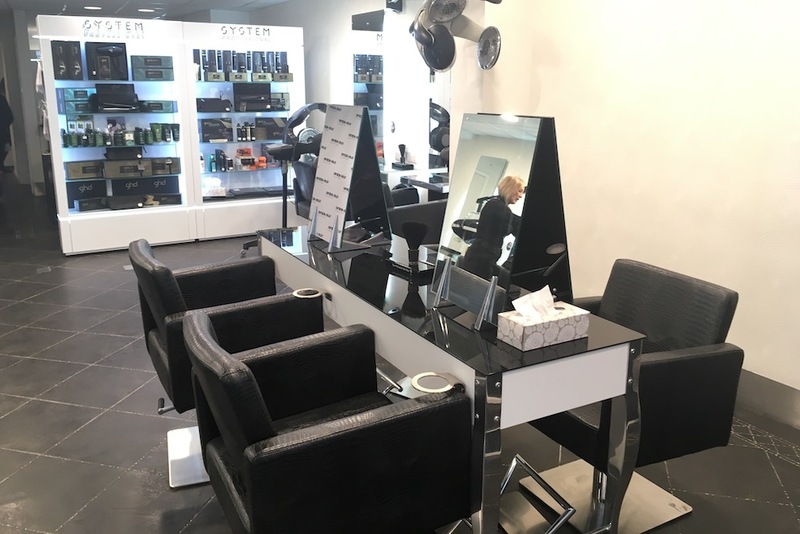 A ladies wash, cut and blowdry starts from £35 with a graduate stylists and goes up to £70 with Sue (who owns the salon), with £5 fringe trims between cuts. My cut and colour with Sophie was £168. Obviously with thick and long hair, I’m at the higher end. 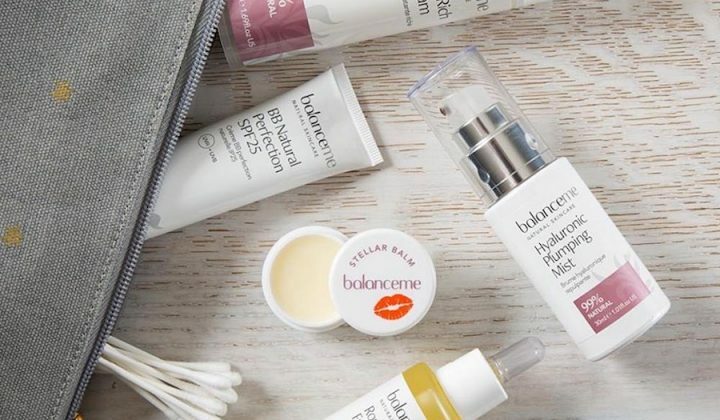 Plus, you don’t need a full head of colour every time.